Despite their delicate appearance, thin, feathery clouds of ice crystals called cirrus may contribute to global warming. Some scientists believe cirrus is quite common, but it is notoriously difficult to observe -- even from satellites, which offer our only means of monitoring such clouds over the entire planet. The Multi-angle Imaging SpectroRadiometer (MISR), one of a new generation of instruments flying aboard the NASA Earth Observing System's Terra satellite, views Earth with nine cameras simultaneously, some at very steep angles through the atmosphere. Scientists on the MISR team have been hoping to learn what contributions their instrument can make to a global inventory of cirrus. 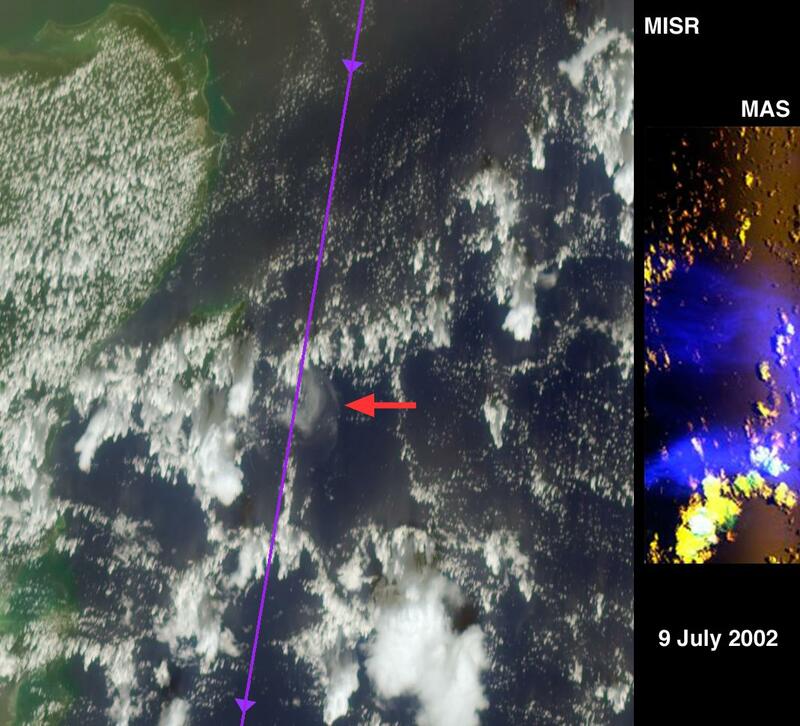 They got their chance to test MISR's capabilities during July 2002, when they joined over 400 other scientists and six research aircraft at the US Naval Air Station near Key West, Florida for the Cirrus Regional Study of Tropical Anvils Layers-Florida Area Cirrus Experiment (CRYSTAL-FACE) field campaign. The campaign had many goals, one of which was making simultaneous aircraft and satellite measurements of cirrus. 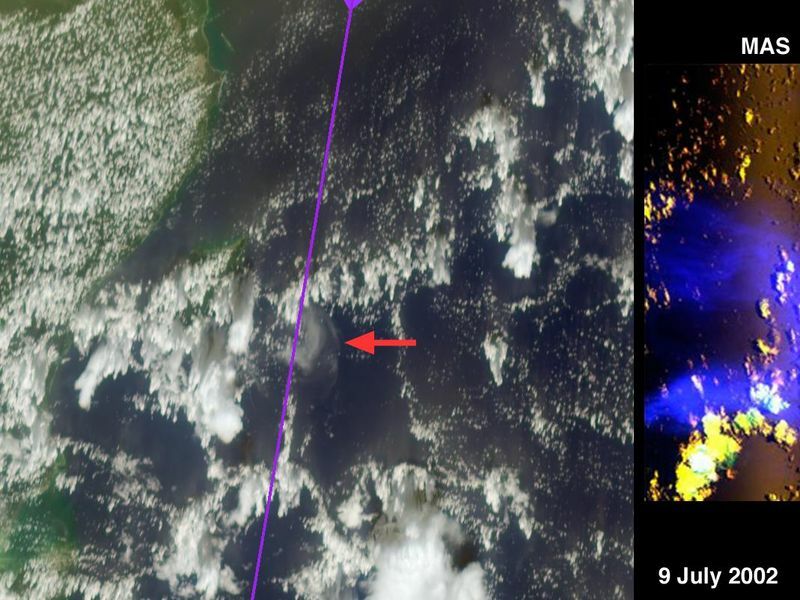 On July 9, the ER-2 stratospheric jet aircraft, carrying a multi-spectral camera called the MODIS Airborne Simulator (MAS), flew in the stratosphere above a 35-kilometer-wide patch of thin cirrus minutes after MISR imaged the cloud from space. At the same time, another NASA high-altitude jet, the WB-57, flew right through the 15-kilometer-high cloud with cloud particle counters and a particle imager. The left side of this montage is a natural-color view of the Caribbean Sea east of the Yucatan Peninsula as seen by MISR's most steeply forward-viewing camera. 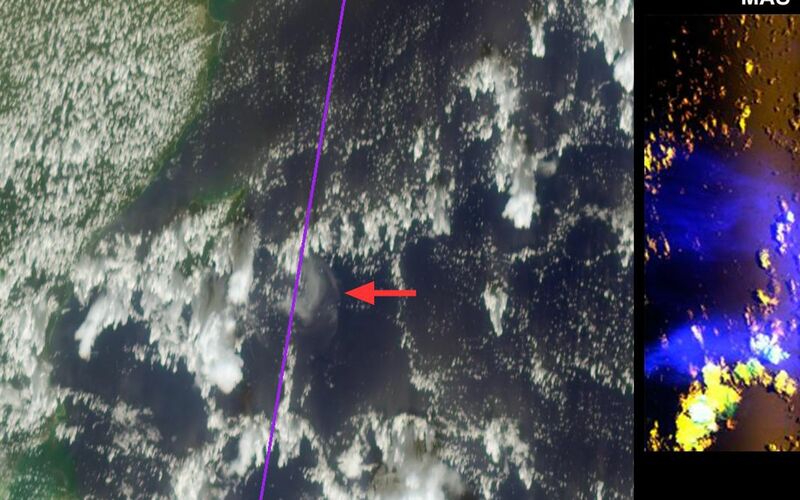 The thin line running roughly north-south was drawn on this image along the flight tracks of the stacked ER-2 and WB-57, and the red arrow points to a crescent-shaped cirrus cloud. 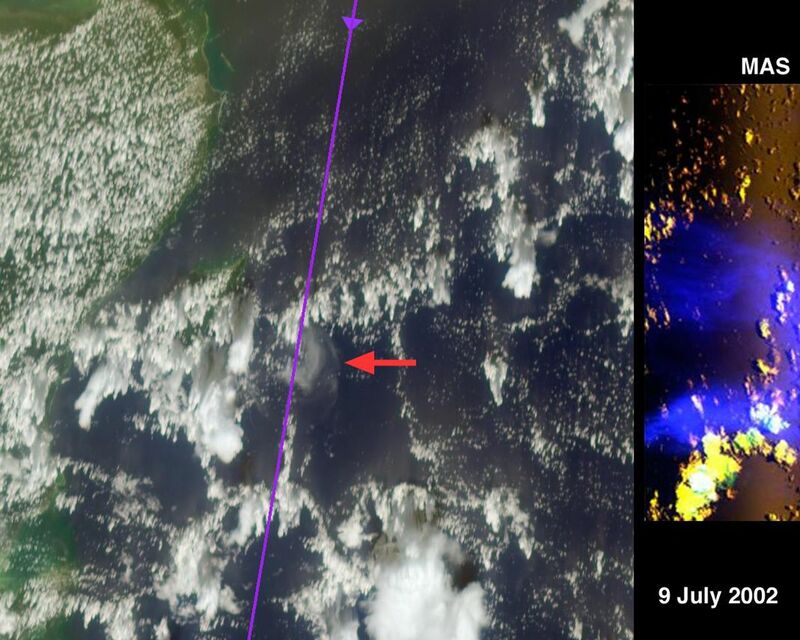 At right is a false-color image taken 700 kilometers closer by the MAS instrument on the ER-2. Data from the MAS shortwave infrared channel that detects cirrus is shown in blue. An animation of the cloud as seen by seven of the nine MISR cameras is also shown. It progresses from the most steeply forward to the most steeply backward view, and excludes imagery from two angles which had significant sunglint. These gray-scale images use MISR's red band. The cirrus is prominent at the steeper angles and virtually disappears in the nearly vertical views. Because it is so much higher, the cirrus seems to move more than the background clouds. The animation also shows the 3-dimensional structure of many towering cumulus clouds. By analyzing these data sets, scientists will learn how effectively they can use MISR observations to map thin cirrus, and to monitor changes in its distribution from season to season and year to year. For more information about the CRYSTAL-FACE campaign, visit: http://cloud1.arc.nasa.gov/crystalface/. The Multi-angle Imaging SpectroRadiometer observes the daylit Earth continuously from pole to pole, and views almost the entire globe every 9 days. This MISR image is a portion of the data acquired during Terra orbit 13606 and covers an area of about 232 kilometers x 267 kilometers. The image contains data from blocks 73 to 75 within World Reference System-2 path 18.